Using secure shredding facilities to be GDPR compliant on paper-based records. The General Data Protection Regulations (GDPR) are increasingly seen as an intimidating subject for businesses. As the deadline approaches in May, there seems to be so much to do to ensure compliance. We wanted to set out how we can help you safely dispose of paper-based personal records with our secure shredding facilities. We can also help you to responsibly dispose of other data containing devices such as discs, IT equipment and mobile equipment. Our secure destructions are done in a completely environmentally sustainable way. For those of you that are unaware of what GDPR is, firstly, it might be worth doing some research on how it might affect your business. Secondly, to help you understand what it is, here is the definition taken from the official EUGDPR website. There is a great deal of focus on GDPR regarding electronic records, but it is not just going to affect your online database records. GDPR is about regulating any records you may have of a person, whether that is online or offline. For this reason, it is crucial that any hard-copy records that need disposing of should be done so at an accredited confidential shredding facility. By doing this you will receive a certificate of destruction which states that your documents have been successfully shredded securely and in a compliant manner. This, in turn, means that you will have actual evidence that your records have been destroyed and you are GDPR compliant. The new regulations do stress that you should have an audit trail in case of any doubt. We issue a certificate of destruction for all confidential waste destroyed. The paper-handling facility is ISO accredited. We offer a range of secure containers that can be placed around your workplace until the contents need to be disposed of. Our shredding facility, provided by our partner Veolia, is local, minimising waste miles. Once the paper has been shredded, it’s then recycled to make new paper. Our confidential waste service benefits the environment. Did you know that recycled paper uses 70% less energy to be produced compared to the usual way of making paper using raw materials? Secure shredding of confidential documents provides paper for recycling. It is a safe and environmentally friendly way to destroy confidential documents whilst at the same time producing materials that are turned into new paper. It fits very well into the circular economy proposal. Recycling paper not only prevents trees from being cut down for paper production, it also reduces energy and water use for paper manufacturing and cuts down on pollution from paper mills. We are committed to limiting the distances waste travels to go to treatment facilities. All the Veolia’s nearest appropriate this severely limits waste miles. Find out more about our confidential waste and secure destruction service. Or, if you want to contact our team please just click on the button below. Do you want to tighten up on all your waste disposal services or use a more environmentally-friendly operator? 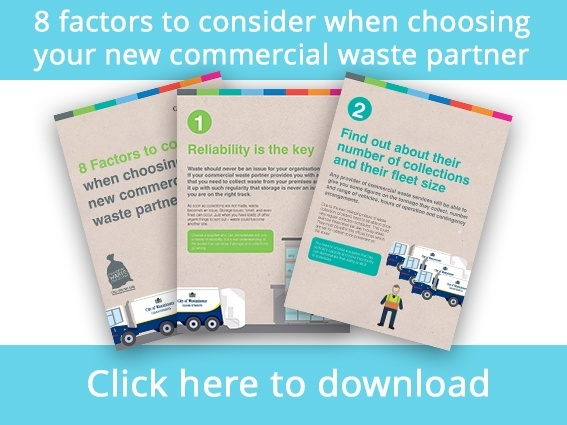 For your everyday collections, we’ve made choosing a waste operator easier than ever with our guide covering 8 questions you should ask before deciding on your new waste operator.